Every collector dreams of pulling an autograph card of Michael Jordan from Upper Deck trading card packs. Sure you can go out and buy one on an online auction site, card shop or trading card show, but there’s nothing like the thrill of pulling an autograph card of Michael Jordan. Upper Deck has long been the exclusive home to autographs of basketball’s greatest legend and collectors still love hunting for Jordan signature cards. 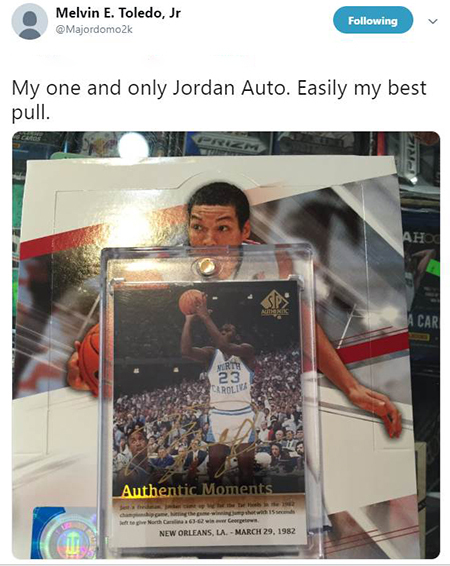 This is Lynn Ball’s story on his quest to pull a signed Jordan card. Pulling a Jordan autograph isn’t easy so when you are lucky enough to score one, it immediately becomes your best ever pull. “Growing up, I deeply loved basketball cards. Every birthday, Christmas, holiday or weekend ended up with me enjoying a steady stream of Upper Deck basketball card packs from the age of seven until I was in high school. I could never afford high-end cards, so I bought low-end product and mostly tried to get players I liked. It was a fun hobby, but as I got older and my responsibilities changed, I stopped buying cards. “I haven’t bought cards in more than 15 years until late last year when my friend John, hit a crazy Shohei Ohtani 1-of-1 card and I started thinking about basketball cards once again. My personal holy grail has always been (like everyone else who has ever bought basketball cards) a Michael Jordan autographed card. I could always pick up an autographed card of Michael Jordan in the hobby, but where’s the fun in that? I have always wanted to rip open a pack and pull a Jordan signed card with my own hands. Like capturing lightning and trying to keep my hands from shaking while I tried to hold on to it. 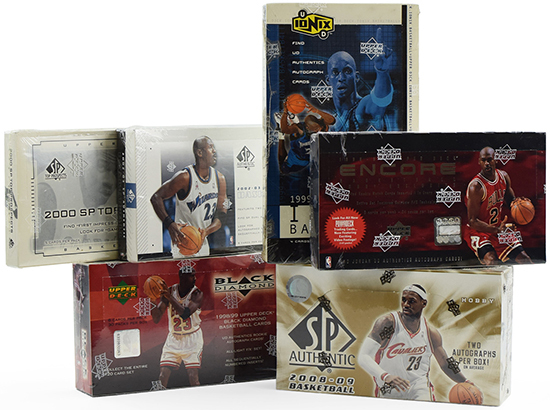 Lynn began cracking older Upper Deck basketball products like these in search of a Jordan autograph card. This display comes from our friends at Dave & Adams Cardworld who worked with Lynn on some of his purchases. 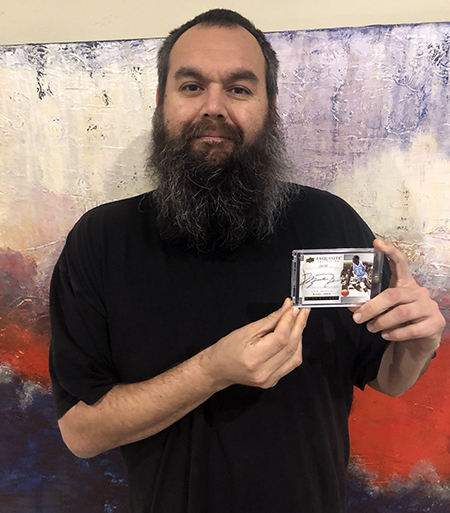 “Beginning in November, I started buying old Upper Deck boxes because that’s the only way to pull the coveted Michael Jordan autograph from a basketball box. It’s a little risky because they are no longer covered by Upper Deck’s warranty so if you get a damaged card or expired offer, they can’t really help, but I thought it was worth the risk. 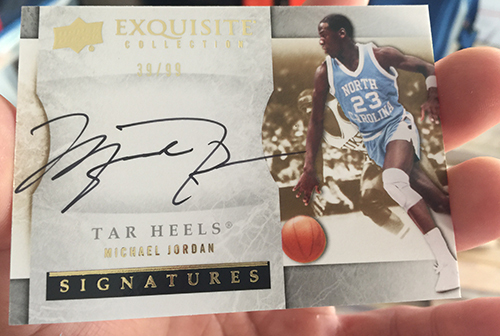 Jordan autographs are in several of new Upper Deck products, but I wanted it to be old school. I figured I could afford a box every month or two and hopefully my day would come. I was in this for the long haul and was dedicated to sticking with this plan for years. I knew that besides Jordan, there are other amazing cards in each of these Upper Deck products and I was sure to pull some really awesome stuff even if I never got a Jordan. I searched for boxes of Upper Deck cards, created a spread sheet to document the possible Michael Jordan autographs in each product along with hits in each box, and their price ranges. I bought one box of 2000-01 SP Authentic, 2013-14 SP Authentic, 2011-12 SP Authentic, and two boxes of 2010-11 Upper Deck Ultimate Collection. And then three months into this process magic happened when I purchased a box of 2014-15 SP Authentic. I peeled open the wrapper with no expectations and as I slowly went through them I hit a monster. Congratulations on the amazing pull and thanks for sharing your story Lynn! Again, it’s worth noting that purchasing older product does have risk as Lynn shares above. They are no longer covered by Upper Deck’s warranty protection so if there are issues with damaged cards, insert ratios, collation or expired offers, there is little Upper Deck can do to assist any longer. If you choose to make those purchases, you do so at your own risk. Our advice would be to make sure you purchase them from Upper Deck Certified Diamond Dealers, Authorized Internet Retailers or Authorized Group Breakers. While there are risks, collectors frequently share that hunting through some of these older products can be a lot of fun.